Baptiste Loisset (1797-1863) was, in the first half of the nineteenth century, one of Europe’s greatest equestrians and circus directors, a major figure in the circus world. He was one of the first horsemen to perform a somersault on horseback (on a "panneau(French) A flat, padded saddle used by ballerinas on horseback.," or flat saddle), and both his reputation and his knowledge of horsemanship led him to finish his brilliant career in the position of director of the royal riding academy at The Hague in the Netherlands—a country this Frenchman called home for most of his professional life. If none of Baptiste’s given birthdates can validate the story of François Loisset in Wagram, it works certainly better with Marengo. But then, why would have his occupation been recorded posthumously as "nailsmith" if he had been an officer in the French army? It is quite likely that the legend of François’s military career has been borrowed from his brother’s. Baptiste was an only child. As the widow of another soldier (who could also have participated in the creation of Baptiste’s paternal legend), his aunt had been awarded a pension, which allowed her to take the young orphan under her wing. She lived with her two daughters in Strasbourg. Strasbourg may have been François’s residency at the time of his death since it is where his funeral is said to have taken place. This may explain the confusion regarding Baptiste’s birthplace. As legend has it, Baptiste was following his father’s funeral procession, holding his aunt’s hand, when a troupe of acrobats showed up parading in the opposite direction; seeing the distraught little boy, the troupe’s manager sent his clown to comfort him. Then, after a conversation with Baptiste’s aunt, the manager accepted to take Baptiste in foster care as an apprentice. The story may have been embellished but it has nonetheless the familiar ring of many a tale of circus dynasties’ beginnings. The troupe’s manager was in all probability Louis Onnfrius Delinsky (often spelled de Linsky or de Linski, perhaps to give the name an aristocratic air), Baptiste’s future father-in-law, who worked as a strong man and the "understander" of his company of acrobats. Louis and his wife, Geneviève Thérèse, née de Gabrielle (or Degabrielle), formed a caring couple who made a decent living from their trade; while Geneviève brought up Baptiste, Louis Delinsky took care of his acrobatic education. In 1808, Delinsky joined forces temporarily with the equestrian company of Jacques Tourniaire (1772-1829) for the festivities of "Napoléon’s Day" in Salzburg, Austria. There, young Baptiste had his first taste of horsemanship under the tutelage of Tourniaire or one of his horsemen. Baptiste showed some flair for it, and he also displayed great strength and courage after a bad fall, which greatly impressed Tourniaire. The equestrian offered to take him as an apprentice, but Baptiste, who was then eleven, chose to stay with his foster parents. Yet, after an unsuccessful Italian tour, Jacques Tourniaire, in need of money, returned to Louis Delinsky, to whom he proposed a true partnership. Louis accepted—thus creating a bona fide circus troupe in which Tourniaire oversaw the horse department and Delinsky was in charge of the acrobats. Tourniaire’s wife, the star equestrienneA female equestrian, or horse trainer, horse presenter, or acrobat on horseback. Philippine Tourniaire, was née Rödiger, a family of menagerie owners and animal traders: A menagerie was soon added to the circus, which made it quite a significant organization. It is during this association with Tourniaire that Baptiste Loisset became apprentice to the famous equestrian. Jacques Tourniaire was a very talented horseman; he had made his performing debut at age fifteen in Philip Astley’s Parisian company and remained there until the outbreak of the French Revolution forced Astley to return to England. When Astley’s Parisian Amphithéâtre was subsequently occupied by Antonio Franconi, Tourniaire joined for a while Franconi’s troupe before creating his own company in 1801. Jacques Tourniaire was celebrated for his taste and his elegance, and not only in the ring: He was known to be a fastidious dresser, a true dandy—traits that he passed on to Baptiste Loisset. To further his equestrian education, Delinsky (or Tourniaire) sent Baptiste to Vienna, where he took lessons with the equestrian master Christoph de Bach (1768-1834) at de Bach’s Circus Gymnasticus on Vienna’s Prater, and then to Paris, where he was furthermore taught by Laurent Franconi (1776-1849), another great equestrian master, at the Cirque Olympique. After that year of advanced training, Baptiste had become a remarkable equestrian and a true riding master. He began to give riding lessons in addition to his performing and, in 1827, published in Germany a small treatise on the training of performing horses, Praktischer Unterricht in Kunstdarstellungen von Pferden, oder Anleitung, den Pferden alle Kunstfertigkeiten zu Lehren, with an additional treatise on horse-breaking one year later. The book was reprinted many times, the latest reissue dating from 1911. The touring territory of the Delinsky-Tourniaire company was principally France, Belgium and The Netherlands&msah;where, on April 27, 1824, Baptiste married Delinsky’s daughter, Virginie Hélène, at Groningen; two months earlier, on March 1, Virginie, who was only sixteen (she was born June 6, 1807 in Amiens, France), had given birth to their daughter, Antoinette Fortunée, also in Groningen, which appears to have become by then the family’s seat. After Antoinette, Baptiste and Virginie would have seven more children. Séraphin François (known as François, 1826-1878), Baptiste’s heir and successor, was a great equestrian and became later a respected director who traveled extensively in Northern and Eastern Europe. He married the star equestrienneA female equestrian, or horse trainer, horse presenter, or acrobat on horseback. Caroline Loyo in 1853. Baptiste Junior married "Mlle. Adeline," a talented equestrienneA female equestrian, or horse trainer, horse presenter, or acrobat on horseback. trained by Ernst Renz, and one of the stars of his company. The marriage didn’t go without hurdles: Baptiste met his future wife in 1851 at Circus Renz, where François, Louise and himself were performing, along with Caroline Loyo, who started a liaison with François. The despotic Ernst Renz forbade flirtations and amorous liaisons within his company, and he didn’t want to lose his star equestrienneA female equestrian, or horse trainer, horse presenter, or acrobat on horseback. : He simply fired the Loissets! François would marry Caroline two years later, and Baptiste would have to wait seven years before he could finally marry Adeline in 1858. The younger Baptiste was a very good horseman who performed a successful jockeyClassic equestrian act in which the participants ride standing in various attitudes on a galoping horse, perform various jumps while on the horse, and from the ground to the horse, and perform classic horse-vaulting exercises. act with his brother François, but his life ended in tragedy: he was sent to a madhouse where he committed suicide by throwing himself out of a window. Henriette Constance, born in January of 1828 in Rotterdam, died in infancy on October 4, 1829 in Groningen. Paul was born November 11, 1829 in Nijmegen (also in The Netherlands), but it is all what we know of him: He, too, probably died in infancy. His sister Louise, born circa 1830, became a talented equestrienneA female equestrian, or horse trainer, horse presenter, or acrobat on horseback. who eventually married (or so it is said) the Count Alexandre Rossi, son of the celebrated German soprano Henriette Sontag (1806-1854), and then disappeared from the public eye. Carl Virgine (known as Charles), born September 27, 1834 in Groningen, became a good equestrian. He published a treatise in 1899 in Germany: Die Dresseur des Freiheits-Pferdes (The Liberty-Horse Trainer). Finally, Victoire was born July 13, 1840 at Utrecht in The Netherlands. As for Antoinette, Baptiste’s and Virginie’s first child, she left the circus and married, in 1847 at Gravenhage (The Hague), the Belgian confectioner Jean-Joseph Roux, who had a shop on the Rue Royale in Paris and with whom she had two daughters, Clotilde and Émilie. Trained by Caroline Loyo, Antoinette’s sister-in-law, Clotilde and Émilie Roux became, under their mother’s maiden name, Loisset, two of the most celebrated equestriennes of their time. Both, unfortunately, died untimely and tragically. In 1824, the year of Baptiste’s marriage with Virginie, Louis Delinsky retired and sold his business. Jacques Tourniaire went his own way with his company and toured extensively with great success all over Europe; in 1837, he introduced the circus to Imperial Russia. 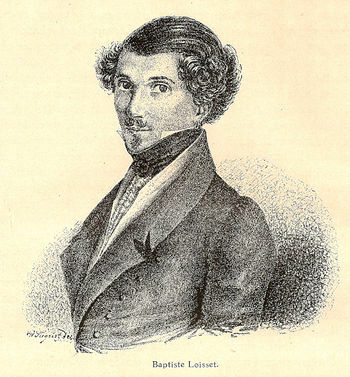 As for Baptiste Loisset, he created his own company, which quickly acquired a great reputation for the quality and elegance of its performances—which reflected indeed Baptiste Loisset’s refined personality. Loisset toured mostly in the German states and Scandinavia, and of course in The Netherlands, where his company was based. (His troupe often performed in Germany under the banner of Königlich Niederländischen Zirkus—"Royal Circus of The Netherlands.") The Cirque Loisset was known for the quality of its performers, notably his equestrians and equestriennes, who were often among the greatest names in the business. Loisset’s company appeared in Berlin in 1826 and 1831 at the Brandenburg Gate Circus. At some point in the 1830s, Baptiste Loisset was named director of the Riding School of Utrecht, a position he held until 1838, when King Willem I gave him the position of director of the 's-Gravenhaagsche Stadsrijschool, La Haye’s Riding Academy. (The manège, on Kazemstraat, is still extent.) These responsibilities were added to the management of his company, which made him a very busy man since his sons François and Baptiste, Jr. were still too young to assist him. In 1844, probably to unburden himself, Loisset joined forces with Paul Cuzent (1812-1856) and Jean Lejars (†1848), who had just left the Parisian company of Louis Dejean, the famous circus entrepreneur who owned and managed the prestigious Cirque Olympique and the brand-new and already fashionable Cirque des Champs-Élysées in Paris. Paul Cuzent was one of Europe's premier horsemen. A consummate circus man, he was a good acrobat, an excellent director, and an able musician; he composed most of the tunes that accompanied his family's acts, and sometimes conducted the orchestra himself. The new company included Cuzent’s very talented sisters, Antoinette (who had married Jean Lejars), Armantine and Pauline. The presence of Cuzent and his sisters (notably Antoinette and Pauline) was enough to guarantee the success of any show in which they appeared. Baptiste Loisset, who was forty-seven, was a non-performing partner in the new concern, which became known in the business as the Cuzent-Lejars troupe, though its official name was Cirque de Paris. It made a triumphal debut at Prague in the Czecho-Slovakian part of the Austro-Hungarian Empire, and then moved to Berlin, where it performed from December 21, 1845 to April 23, 1946 in a wooden construction(French) A temporary circus building, originally made of wood and canvas, and later, of steel elements supporting a canvas top and wooden wall. Also known as a "semi-construction." erected on the Döhnoffplatz. After Berlin, the Cirque de Paris traveled to St. Petersburg, the capital of the Russian Empire, and, on October 8, 1846, opened its doors in a wooden construction(French) A temporary circus building, originally made of wood and canvas, and later, of steel elements supporting a canvas top and wooden wall. Also known as a "semi-construction." built near the prestigious Alexandrinsky Theatre, off the Perspective Nevskiy. It found itself in a fierce competition with Alessandro Guerra’s Cirque Olympique, which had arrived in St. Petersburg the previous year, in November 1845. There, Guerra’s troupe met with considerable success—which undoubtedly had attracted the Cuzent-Lejarses to the imperial capital. The Court and the aristocracy had fervently patronized Guerra’s Cirque Olympique, but their enthusiasm now shifted toward the Cirque de Paris, which was, in their opinion, more refined and elegant and, to many, offered the most beautiful and talented equestriennes, especially Pauline Cuzent and the ravishing Antoinette Lejars, whom the Russian aristocrats quickly showered with their usual largesse. Guerra answered by bringing to St. Petersburg the "Diva de la Cravache" (the "Diva of the Whip"), the great Caroline Loyo, and a brilliant Italian horseman who would later write an important chapter of Russian circus history, Gaetanno Ciniselli—but to no avail. St. Petersburg was fascinated by this “circus war,” and the Imperial family, including Czar Nikolai I, visited both circuses several times. After three months of an expensive competition, however, Alessandro Guerra threw the towel and returned to Vienna, where he had succeeded Christoph de Bach at the helm of the Circus Gymnasticus. The "circus war" gave circus arts in Russia an unprecedented vogue. Czar Nikolai I, well aware of it, decided to put the Circus on the roll of the performing arts supported (and controlled) by the State. These already included Drama, Opera and Ballet. The Direction des Théâtres Impériaux (Direction of The Imperial Theaters—French was the language spoken in St. Petersburg, Russian being reserved for the servants) acquired St. Petersburg's two circus buildings, leaving Paul Cuzent at the wheel of his, which was pompously renamed Cirque de la Direction des Théâtres Impériaux. Baptiste Loisset passed away eight years later, on February 25, 1865—just one month after the death of his wife of forty-four years, Hélène. They were buried at the cemetery of Maisons-Laffitte, where, unfortunately the Loisset-Delinsky grave has disappeared in the destruction of the old cemetery in 1890 to make room for Maisons-Laffitte’s new city hall. The present cemetery doesn’t have any marker or memento of the Loisset-Delinsky tomb. In 1854, François Loisset and his wife, Caroline Loyo, had revived the Cirque Loisset, which toured the traditional Loisset territory with uneven success, and was in financial trouble when François Loisset died in 1878 in Stockholm. Caroline Loyo shut down the company, and the famed Cirque Loisset disappeared forever. Sadly, when the great equestrienneA female equestrian, or horse trainer, horse presenter, or acrobat on horseback. died in Paris in 1892, she was practically forgotten and destitute. Sic gloria transit!